Yesterday was a very strange day…. My sister who is visiting from Melbourne, my Dad and I went for a drive to check out a couple of art galleries…. Seems easy enough right… WRONG! 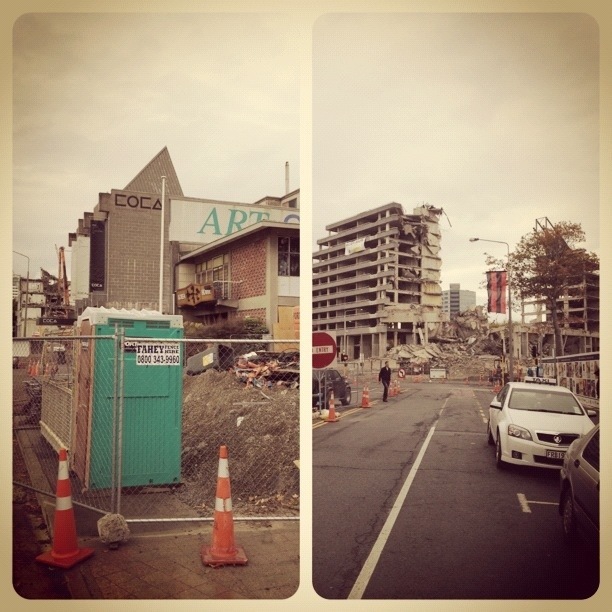 Wowza, our city is a demolition zone… For those who don’t know, Christchurch has been hit with a series of earthquakes, with the most damaging quake (22/02/11) destroying a lot of our inner city buildings and claiming the lives of 185 people, including one of my absolute favourite clients. Every street we turned down was blocked and whenever we did get to drive more than 200 meters, the rubble of demoed buildings that surrounded us was somewhat soul destroying…. I know it’s only bricks and mortar but it’s a reminder of all of those people who lost their lives that day and of the ones they left behind that have to endure that loss every single day. The city has lost its soul…. It’s just bricks and rubble and rather depressing. Looking forward but definitely not forgetting.